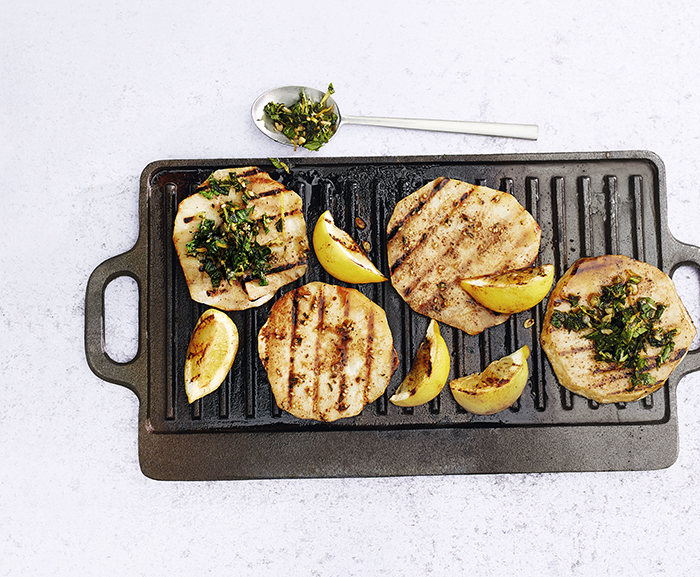 Celeriac steaks are a delicious way to lighten up your summer BBQ, particularly if you’re not a fan of mock meats. They make a great replacement thanks to their smooth, velvety texture and are a flavour explosion with the addition of the salsa verde. Prepare and light the barbecue or preheat a grill or griddle. Mix the olive oil with the dried herbs, then season. Peel the celeriac, trim and cut into 4 x 1cm thick rounds then brush with the flavoured oil. Cook slowly over a warm barbecue, turning often and brushing with the herby oil for 25 minutes until tender and golden. Meanwhile, mix the finely chopped herbs with the garlic, capers, walnuts, lemon zest and olive oil, then season. Spoon over the steaks and serve with lemon wedges.